Due to weather conditions and snow, ice, rain and humidity, tour conditions can change and harden. A good self-appraisal is necessary. You can also do an introductory acclimation tour in advance with your guide. For beginners – the experience of walking with crampons is not essential. The absence of vertigo and some insurance are necessary. 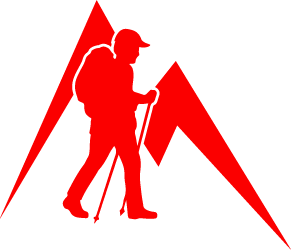 Experience in mountain hiking. The first or one of the first high moutain tour experiences. Easy climbing I.-II. UIAA grading system. An experience of handling crampons should be available. You already have experience in high mountain tour. Easy climbing to medium II.-III. UIAA grading system. Passages on snowfield up to 45 °. The absence of vertigo and some self-insurance are necessary. An high moutain tour experience (moderate) should be available. Moderate climbing III.-IV. UIAA grading system. Passages on snowfield / ice passes up to 60 °. The absence of vertigo and some self-insurance are necessary. Long passages on exposed ridge. An high mountain tour experience (difficult) should be available. Knowledge of rope handling and stowage should be available. Difficult climbing IV-VI UIAA grading system. Passages on snowfield / ice passes 60 ° and more. Long exposed ridge sections. Mixed rock / ice field. The absence of vertigo and some self-insurance for long exposed ridge sections are required. Due to weather conditions and snow, ice, rain and humidity, tour conditions can change and harden. A good self-appraisal is necessary. Light climbing (beginners / children) up to grade 3 UIAA grading system. Easy terrain of climbing with close steps, the flat terrain alternates with partly vertical passages. The absence of vertigo and some self-insurance are necessary. Moderate climbing to grade 5 UIAA grading system. The steps become smaller, mostly steep / vertical crossings / terrain. Power and endurance in the arms as well as the absence of vertigo are necessary. Difficult climbing up to 7th grade. Small steps, mostly steep, vertical and overhanging the terrain. Knowledge of security equipment is required. Spirit, strength and stamina are more and more necessary. Very difficult climbing (more than 7th grade). Very good level 3 climbing skills are basic requirements. Very good strength, endurance and mental strength are very important. Difficult hiking trails with secure rock passages. There are already short metal pins and ladders to overcome (vertical). No experience of via ferrata is necessary. The absence of vertigo and some self-insurance are necessary. Via ferrata with exposed areas also vertical. Metal pins, bridges and ladders are available. Passages to rest and have breaks are frequent. No experience of the via ferrata is necessary. The absence of vertigo and self-insurance are necessary. Via ferrata with difficult exposed areas, physically demanding / exhausting. Ladders (even longer) partly overhanging. The trail leads on a vertical ground. The distances between the hooks and the iron pins may be longer. Some passages for rest and pause. Very difficult via ferrata with very exposed places, very difficult and physically exhausting. Ladders with longer overhanging passages. The trail also leads through overhanging terrain. There are practically no passages for rest and break available. Level 3 experience is required. Easy mountain hike / mountain trails. Partially narrow paths. Paths may have short rocky sections. The absence of vertigo and some self-insurance are necessary. The mountain trails become more demanding, more rock sections, the difficult places are assured. Roads also lead to higher altitudes. In part, hands are used to help. Absence of vertigo and some self-insurance are also a required here. Difficult and steep mountain hiking trails in partially unlined and partially exposed terrain. Difficult exposed areas are partially secured with ropes. The experience of alpine mountain trekking, absence of vertigo and some self-insurance are necessary. Mountain trails become more rocky, steep and difficult. The trails are often unmarked and steep. Secure areas are frequent and exposed. The use of hands is necessary when going up and down. A great experience of alpine hiking, absence of vertigo and some self-insurance are necessary. S0 describes a single trail which has no particular difficulties. These are mainly forest roads and meadows on natural non-slip soils or gravel. Steps, rocks or root passages are not expected. The slope of the path is easy to moderate, the curves are wide. On a path described by S1, we must already expect smaller obstacles such as flat roots and small stones. Very often, isolated gullies and erosion damage explain the increased degree of difficulty, the subsoil may be partially non-solidified. The gradient is maximum 40%. Hairpin bends are not expected. In S2, you must expect roots and larger stones. The soil is often not solidified. Steps and flat stairs are to be expected. Often, there are tight curves, the slope has passages up to 70%. Individual blocked trails with many large rocks and / or root passages belong to category S3. High steps, laces and difficult inclines are common, easy rolling sections are rare. You can often expect slippery surfaces and scree, steep slopes of more than 70% are not uncommon. S4 describes a very steep and heavily blocked single trail with large rocks and / or difficult root passages, often between loose rocks. Extreme ramps, narrow laces and steps, where the plateau inevitably touches, are common for Grade 4. The S5 is characterized by rugged terrain with ridges, rocks and landslides, loop-shaped hairpin bends, several successive high plateaux, and obstacles such as fallen trees – all of which are often extremely stiff. . For sure, there is little space for rolling or stopping distance. The obstacles must be partially mastered in combination.